The Library schedules more than 60 evening events a year featuring authors, filmmakers, musicians, journalists, and other public figures and experts. All but a few of these programs are free (with a suggested donation of 10 euros) and open to the general public, thanks to continuing support from the Annenberg Foundation, and in the case of authors, they include a book-signing after the program courtesy of a local English-language bookstore. The Library welcomes speakers like Jeffrey Goldberg, Kristin Scott Thomas, Jim Gaffigan, Reza Aslan, Ta-Nehisi Coates, Rachel Kushner, Marianne Faithfull, Nicole Krauss, Tash Aw, Colson Whitehead, Viet Thanh Nguyen, Sebastian Faulks, David Hare, Jane Smiley, Jimmy Buffett, Emmanuel Carrère, Hisham Matar, Gary Shteyngart, Jelani Cobb, Adam Gopnik, David Sedaris, Michael Palin, Richard Ford, Joe Klein, Paul Auster, among many, many others, twice a week. Our regular event nights are Tuesdays and Wednesdays. 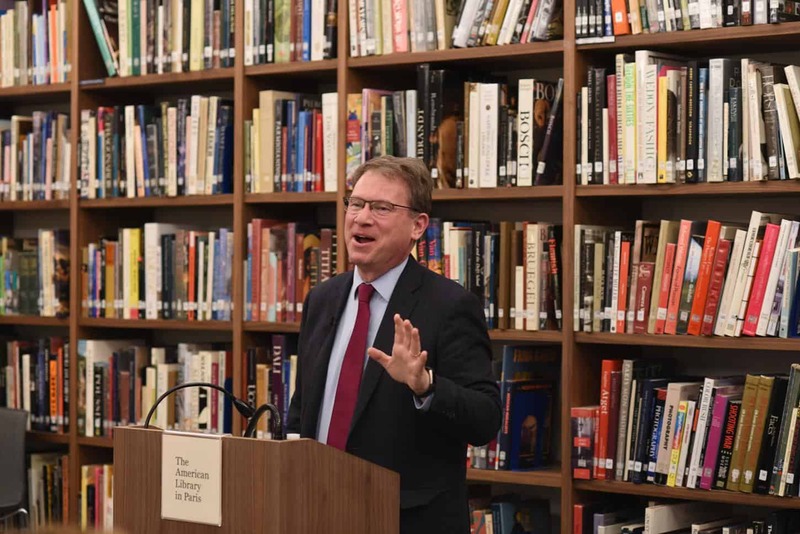 Jeffrey Goldberg, editor in chief of the Atlantic Monthly speaking on 14 February 2017. The Library recruits speakers for these programs, but also reviews scores of inquiries from publishers, writers, and others. The events calendar is competitive and busy, but if you would like to propose a program at the Library, please write to programs@americanlibraryinparis.org. Books about France and the French-American encounter are found regularly on our schedule, but Library audiences have an appetite for all manner of subjects. The Library supports local writers, however we have limited availability and are unable to accomodate everyone. Authors of self-published books will be considered, but the Library gives priority to books from established publishers reviewed by established media. The Library neither sells books nor permits the author to sell his or her books on the premises as we partner with local bookstores for this purpose. Please note that the Library pays no honorarium or expenses for guest speakers. The Library also has a professional lectern with amplification, as well as lavalier and hand-held microphones for speakers who prefer to speak while in motion. The Library has a screen and projector for visual presentations to accompany speakers. It connects to both Mac and PC laptops as well as iPads and iPhones. All programs are in English, although audiences, like the members of the Library as a whole, are largely bilingual and come from many countries. All programs are on Tuesdays and Wednesdays, excluding holiday periods, and begin at 7:30 p.m. The speaker’s presentation and the questions and answers which follow conclude within one hour, so thirty minutes is the optimum length of a presentation. The Library’s Florence Gould Reading Room, where the programs take place, seats 75 people. Audiences range from 25 to 120, with the average attendance of 60 people. The Library publicizes events on this website, on its social media platforms, in its biweekly electronic newsletter reaching 6,000 subscribers, as well as on flyers and screens in the Library itself. Please note that the Library very occasionally must reschedule appearances in order to take advantage of extraordinary opportunities.